and audiovisuality through the concept of ‘resonance’, drawing in particular on its use in Deleuzian philosophy. It examines resonance as the process through which (audial, visual, medial) elements interrelate, thereby triggering, through medial dissemination (‘dissemediation’) and the explosive potential of sound and image, a transformation into a new heterogeneous, shifting and transient whole (‘musicomic’). This is explored across three different formats: digital comics, comics performances, and comics-music albums (which combine a comic book and a music album). The article analyses resonance in a range of case studies from the Francophone field: in the inextricable audiovisuality of Marietta Ren’s 2016 digital bande défilée Phallaina; the dialogue between music and comics as performing arts in the concert de dessins series at the Festival International de la Bande Dessinée d’Angoulême; and, in relation to music-comics albums, through politico-aesthetic resonance as an act of remembrance in Jacques Tardi and Dominique Grange’s 1968–2008… N’effacez pas nos traces! (2008), and the (dis)orienting experience of the sound-landscape of Baladi and Ghostape’s Charge (2014). These audiovisual practices explore and bridge the gap(s) between music and comics, and orchestrate their resonance in differing ways, involving the experiencer in this process as she oscillates between reader, listener, viewer, and/or synchroniser. This article will focus on audiovisual practices in the French-language bande dessinée field, in which music and comics are created and experienced together, rather than on the visualisation of music in comics or the ‘musicality’ of the medium as it has been articulated by creators and scholars, though these will necessarily inform the analysis. Music–comics encounters will be explored across three different formats: digital comics, comics performances, and comics-music albums (which combine a comic book and a music album, usually in the form of a CD or audio files). As we shall see, these audiovisual practices explore and bridge the gap(s) between music and comics in differing ways and involve the experiencer in this process as they oscillate between reader, listener, viewer, and/or synchroniser. These variations, in terms of the musical and comics elements and their modes of interaction, contribute to the multiplicity of the ‘valeur ajoutée’ that goes both ways between music and comics, to borrow Michel Chion’s term on audiovisuality in film and to echo his understanding of audiovisual combination as mutual transformation (28). This directly relates to the approach to intermediality that this article will take. As Irina O. Rajewsky points out, intermediality is a concept that is ‘widely applicable’, and widely applied, a proliferation that is both potentially rewarding and confusing, meaning that it is necessary to define one’s use of the term (44–5). I am here following Chiel Kattenbelt’s emphasis on intermediality as assuming ‘mutual affect’ and ‘co-relations […] that result in a redefinition of the media that are influencing each other, which in turn leads to a refreshed perception’ (25). Taking music–comics interactions as its impetus, this article will investigate intermediality and audiovisuality through the concept of ‘resonance’, which will be understood as the triggering, through medial dissemination (‘dissemediation’) and the explosive potential of sound and image, of a process of reassembling into a heterogeneous, dynamic and transient whole (the ‘musicomic’). These audiovisual practices will first be mapped out within the broader context of music–comics relations, in creative as well as critical terms. We will then turn to the question of sound-image and intermedial gap(s) and the concept of resonance, drawing on its use in Deleuzian philosophy and film studies. Through this theoretical framework, the potentiality of music–comics encounters will be explored in case studies: in the fusion of sound and image in an immersive, submerging experience in Marietta Ren’s 2016 digital bande défilée Phallaina; the dialogue between comics and music as performing arts in concert de dessins at the Festival International de la Bande Dessinée d’Angoulême (henceforth FIBD); and, finally, in relation to music-comics albums, in the tracing of politico-aesthetic resonance in Jacques Tardi and Dominique Grange’s 2008 1968–2008… N’effacez pas nos traces!, and the fluctuating experience of the sound-landscape of Baladi and Ghostape’s 2014 Charge. Comics have long engaged in a productive dialogue with music, which we can situate in the broader movements of modal and medial border crossings through which both artforms have developed. Cross-pollination has arisen out of dynamics ranging from practices of commercialisation to experimentation, from R. F. Outcault’s popular comic strip character The Yellow Kid’s ‘medial transgressions’ into music, but also theatre, advertising, or toy manufacturing in the late nineteenth century (Meyer 2016), to the exploration of the ‘space between music and graphic art’ in Cathy Berberian’s 1966 Stripsody, whose comics-inspired score ‘[requires] the singer to effectively sing drawings’ (Shaw-Miller 2015: 481–2). Across this history of medial intersections, music–comics encounters have often stemmed from artistic collaboration. In the bande dessinée context, and to refer to contemporary examples, we can mention, for instance, cartoonist Christophe Blain and singer-songwriter Barbara Carlotti’s appropriation of 1960s and 1970s counter-culture in their 2013 ‘bande dessinée musicale’ La Fille (Gallimard); or, inspired by Berberian’s Stripsody, violinist Brice Catherin’s performances, since 2008, of ‘partitions de dessinateurs ne connaissant pas le solfège’. In addition to collaborations, there are instances of ‘complete practice’, as in the case of Romain Renard, a comics artist-musician whom we may compare to other ‘figures amphibies’ (Flynn 2013) such as écrivains-cinéastes. Renard has combined both his artistic practices in the Melvile universe (whose name refers to the town in which the stories take place), creating the bandes dessinées (the first two volumes were published by Le Lombard in 2013 and 2016) and their soundtracks. Both La Fille and Melvile stand as examples of music–comics interactions as part of a broader transmedial practice: Blain and Carlotti transposed La Fille to the stage in 2014, in a show directed by Jean-François Auguste; and Melvile is a cross-media universe, ‘augmented’ in apps and concerts. It should be noted that the division between audiovisual creations and ‘soundless’ comics can be porous.4 Albums that originally used music in a process of what Werner Wolf has called ‘intermedial thematization’ (2017: 247) can then become part of an audiovisual combination. For instance, Philippe Paringaux and Loustal’s 1986 Barney et la note bleue (Casterman), about jazz saxophonist Barney Wilen, led to a meeting with the musician, who recorded the comic’s ‘soundtrack’ in 1987, which was then included as a CD in the album’s re-edition in 2016. Some comics are also available in two versions: a ‘soundless’ paper version and a digital version in which a musical track is integrated, as is the case with Reinhard Kleist’s Johnny Cash: I See a Darkness (Carlsen, 2006), also available in iPhone (2009) and iPad (2010) versions, developed by Ave!Comics. With music-comics albums such as La Fille or Melvile, sound and image can also, of course, be experienced separately, as audio and visual texts, rather than one audiovisual text. What Victoria Addis sees as the propensity of comics for ‘musicalization’ (a term she borrows from Wolf), in texts that capitalise on the ‘formal parallels between music and comics’ (26), stems in part from the perceived ‘musicality’ of the medium. This has been theorised notably by Thierry Groensteen, who talks of ‘la dimension rythmique et musicale inhérente au dispositif de la bande dessinée’ (2011: 149). Groensteen agrees with Andrei Molotiu (2009) that abstract comics in particular bring out this musicality, and he further points out that while this dimension may not be as apparent in figurative and narrative comics, it is nonetheless often mentioned by creators (2011: 149).8 Renard, for example, evocatively talks of the ‘notes intérieures’ that accompany and accentuate his drawing as ‘ce que l’on ne voit pas mais qui est pourtant bien dessiné’ (130). This creative process of thinking musically about the visual mirrors the frequent use of visual metaphors by musicians, thereby participating in the broader ‘synaesthetic’ thinking about the arts that Shaw-Miller has theorised in Eye hEar (2013). How, then, is the musical score of the comic read or performed when it is combined with listening to actual music? This will be explored throughout this article, which moves on from discussing ways in which comics are like music to investigate what happens when comics – and not only comic books – and music are created and experienced together. Key variations in the modes of the encounter, and the two medial elements that are combined, shape how this is realised and received. What I call ‘music-comics albums’ are characterised by a flexible, malleable audiovisuality. The two separated medial elements are synchronised by the experiencer, who orchestrates the combination of the recorded music and the comic book, each in itself shaped by the interconnectedness of its various elements. The music has a ‘fixed sequentiality’ (Elleström, 19), while the comic is a static surface of visual fragments whose reading process is potentially multidirectional, linear, and tabular.10 In digital comics, there is of course no book, but a screen, and the image may be static, moved (through scrolling) or moving (as in motion comics). The transformation of comics into a screen-based medium – which can, at times, blur the boundary between comics and animation – results in, as Daniel Merlin Goodbrey has shown, ‘new tools and tropes’ (2013) and, crucially for our purposes, the possibility of including an audio track. When sound (voices, music, and/or sound effects) is integrated, its association with the image is generally pre-synchronised, and it can be triggered by the experiencer by clicking or scrolling to the sync point. While it is the imagetrack that contains the recognisable ‘traditional’ comics elements, the digital comic itself is audiovisual. In performance, music and comics are synchronised live, their interaction usually planned and rehearsed but subject to improvisation. The stage is a multiple ‘material interface’ (Elleström, 28–9) that often includes bodies playing and drawing, and a screen onto which the comic is projected. The performance is also inscribed in the space in which it takes place. This is often a theatre, a music venue, or a bookshop, but it can be a spatial context imbued with a different aesthetic, social, and/or cultural dimension: a cathedral, as with comics collective Eina!’s August 2015 performance in Tende; or a remand centre, as was the case for a September 2014 performance of rock band The Hyènes’ BD-concert Au vent mauvais (based on Thierry Muret and Rascal’s comic, published by Futuropolis in 2013). In terms of the format of the comics element, in BD-concerts a pre-existing comic book is generally adapted and merged into a ‘moving strip’, the fundamental comic book unit of the page (Groensteen 1999: 69) collapsed and morphed. By contrast, in comics performances such as FIBD’s concerts de dessins the edifice of the comic is under construction as it is being drawn live. The comics element combines with music that is itself already audiovisual when the musicians are seen playing, and when cartoonists are seen drawing too; gestures therefore interact along with the sound and image they are creating. It should be noted that by considering digital comics and comics performances as comics, I am following social and cultural definitions of the medium according to which ‘comics can be defined as objects recognized by the comics world as comics’ (Beaty, 37; see also, about performances specifically, Herd 2013), in contrast, for example, with Groensteen’s view that it is ‘fondamentalement une littérature’ (2011: 82). Against this framework, the digital format is the mode of music–comics combination whose audiovisual potentiality, in spite of obvious key medial and technological specificities, is the closest to that of sound film – or perhaps even more so to that of animation, in its visual and sonic creation of a universe.13 By contrast, music-comics albums and performances are not based around the construction/subversion of an ‘illusion unitaire’ (Chion, 107–9), but rather around the constant awareness of a gap that is being bridged. It is with music-comics albums that the audiovisual gap most clearly becomes a generative space for the experiencer who actively participates in it, as it is they who re-associate the separated image and sound. I would suggest that the concept of ‘resonance’ is productive here. Unlike ‘in-between’ and ‘both-and’, resonance is not about where intermediality is located or what it is, but focuses rather on what it does and how it works. Because it refers to an occurrence, it further shifts the emphasis to dynamics and becoming, and therefore encompasses the ‘liveliness’ of intermedial interactions. Resonance is also suggestive for the exploration of audiovisuality, if it is understood through the idea of generative difference. I am here drawing on the Deleuzian (and Guattarian) conceptual toolbox, the productivity of which is evident for audiovisuality (see, for instance, Redner 2011, on film music) as well as for intermediality, because it privileges, as Jasper Sluijs and Anneke Smelik state, ‘difference over similarity, dynamic multiplicity over single linearity, and the rhizome over hierarchy’ (179). As Manola Antonioli and Bruno Heuzé point out, resonance ‘crosses the whole Deleuzian corpus through the years’ (87), as the ‘dynamic consistency’ of a ‘theory of multiplicities, incompossibles, and heterogenesis’ (88). To refer in particular to early and late formulations, in Logique du sens, it is through resonance that ‘il semble que tous les évènements même contraires soient compatibles entre eux, et qu’ils s’entr’expriment’ (Deleuze 1969: 208); and in Qu’est-ce que la philosophie?, concepts ‘entrent librement dans des rapports de résonance non discursive’, as ‘tout résonne, au lieu de se suivre ou de se correspondre’ (Deleuze and Guattari 1991: 28). Resonance helps us to go beyond a binary opposition between sameness and difference, consonance and dissonance, harmony and chaos (see Antonioli and Heuzé 2012), to explore ways in which disjunction is generative, as well as the multiplicity and heterogeneity of seemingly homogeneous wholes. As such, it enables us to refine what, in See this Sound, Daniels and Naumann view as one of audiovisuology’s aims, namely to make explicit, across disciplines and artforms, ‘both the possible synthesis and the contradiction between images and sounds’ (144). We can say, with regard to both audiovisuality and intermediality, that there can be synthesis in contradiction, and fusion in separation, arising from, across or in the gap(s), which are understood here as unstable and shifting, imbued with the potential for disruption as well as connection. It is this concept of resonance that we will attempt to bring into contact with the potentiality of music–comics interactions, and the ways in which this is realised and experienced across formats and materialities. Resonance is a transdisciplinary concept, whose uses play on its connotations of a sound deepening, of reverberation, prolongation, and reinforcement by reflection or synchronous vibration. This suggestiveness has enabled it to be deployed, in the arts and humanities and social sciences, to think about dynamic processes such as the ‘traveling frequencies of literary texts’ in Wai Chee Dimock’s ‘diachronic historicism’ (1061); or the formation of human subjects as resonant beings in Hartmut Rosa’s sociology of the relationship to the world (2016). Closely related to our purposes here is Walter Murch’s brief but evocative articulation of ‘conceptual resonance’ as occurring in rare cases where ‘the sound makes us see the image differently, and then this new image makes us hear the sound differently, which in turn makes us see something else in the image, which makes us hear different things in the sound, and so on’ (xxii). While Murch’s discussion is limited to his field of expertise, sound film, I see resonance as a broader mode of understanding audiovisual and intermedial relations through positive difference – and music–comics interactions as a potent form for the exploration thereof. The limitedness of Murch’s discussion of resonance is pointed out by D. Travers Scott, who cultivates the concept as a refinement of intertextuality, which in his view is overused. Scott understands resonance as ‘the active, sympathetic amplification and clarification of commonalities between texts’ (53). This echoes my approach, and Scott does apply this framework to an audiovisual encounter (the Pet Shop Boys’ score for Battleship Potemkin), thereby not limiting his understanding of intertextuality to ‘verbal intersemiotic relation’, as Wolf (2009: 47) does for instance.17 Scott’s use of intertextuality means that he is focusing on relations based primarily on resonance between what is shared by texts; by contrast, and partly because my focus is on audiovisuality and intermediality, I view it as a process that is generative of something more, and something else, than the amplification and clarification of commonalities. Specifically, by ‘resonance’ I mean the process through which (audial, visual, medial) elements interrelate, triggering a transformation into a new heterogeneous whole – what, for our purposes, I will call ‘musicomic’.18 ‘Musicomic’ does not refer to empirical givens, to what is ‘already there’ in the work, but rather to what is dynamically and transiently created in the experience of it, through the active part played by the reader-listener when scrolling, spectating, or synchronising. The elements that are put into resonance are not homogeneous themselves, but made in and through difference, each a whole of fragments that connect and stem outwards to the fragments of another whole. In the experience of music–comics encounters, interactions may occur between a potentially open-ended combination of aspects such as tone, texture, melody, lyrics, or the grain of a singer’s voice; and mise en page, colour, text, interframe space, or graphic style. Resonance scatters and transforms each element, in a process not of correspondence but rather of rhizomatic interconnectedness. This participates in a movement of medial dissemination (what one could call ‘dissemediation’) and heterogenerative explosion of sound and image, shifting and shifted in their encounter, becoming a new whole as musicomic. In order to investigate this in practice, with no aim at exhaustivity but with a view to begin to approach the breadth of practices and approaches, we will now turn to case studies to explore resonance – aesthetic, narrative, political – in a range of music–comics encounters. Let us turn first to the mode of music–comics interactions in which sound and image are integrated and pre-synchronised. What is the place of generative music-comics difference when we are presented with an already constituted whole, its gaps and fissures bridged, when the music is inside rather than outside the bande dessinée? Sound film provides us with an established framework to turn to here, but that must of course be adapted to the specific audiovisuality of music–comics interactions. As touched upon above, Murch sees what he terms ‘conceptual resonance’ as occurring very rarely in sound film, when the sound is at ‘exactly the right distance’ from the image in cases of ‘dimensional’, rather than ‘flat’, audiovisuality (xxii) that involves the viewer.19 This is a useful starting point for our analysis of Marietta Ren’s 2016Phallaina, in which sound–image relations develop through a dynamic of immersion and inextricability. Phallaina is a bande défilée that is available as a free application (in both French and English) on tablets and smartphones, and that was introduced at FIBD’s ‘Jeune Talent’ pavilion with a 115-metre long physical fresco accompanied by an interactive sound design. The project is clearly inscribed with a dynamic of innovation:20 it was co-produced by the Direction des Nouvelles Ecritures et du Transmédia de France Télévisions, and Ren worked with Small Bang studio, who characterise their practice as exploring ‘les nouvelles formes de narration spacialisée’.21Phallaina is, in its author’s words, a ‘BD numérique expérimentale’ in which ‘le case par case, le page par page de la BD traditionnelle disparaissent’ (Chapuis 2016). The bande défilée format of a ‘digital ribbon’ is inspired by Japanese and Chinese handscrolls (Lambert 2016),22 and Phallaina’s aesthetics are notably influenced by nineteenth-century illustrator Aubrey Beardsley’s work on clear outlines and flat tints of black and white (Siméone 2016). The experiencer scrolls horizontally (they can scroll forward or backward) through a text-image audiovisual narrative that includes parallax effects to create depth perception. The user retains constant control of the reading pace, the only imposed pauses occurring at the end of each chapter as the next one loads. As Ren – whose background is in animation – explains, drawing on cinematic vocabulary, we scroll through ‘un long travelling […] avec des enchaînements très naturels sans coupure d’image d’un plan à un autre’, resulting in a ‘perception très naturelle, très immersive’ (Siméone 2016). As part of Phallaina’s immersive ‘dispositif multisensoriel’ (Crombet 2017), sound (designed by Côme Jalibert) is fluidly integrated, emerging and stopping when the experiencer scrolls to specific points in the narrative. Phallaina is not a sonically or musically ‘saturated’ universe, as is often the case in animation (Coyle, 7); and the fact that the characters’ voices are textual (in speech balloons) means that there is no process of vococentrism (Chion, 14–15) that would focus the experiencer’s auditory attention. Phallaina tells the story of a young woman named Audrey who experiences visual and auditory hallucinations during which she feels and hears as if she were underwater and sees fish and whales. She is diagnosed as epileptic, and having a ‘physeter’ in her brain – an anomaly that translates into a natural ability for breath-hold diving. In the hope of learning how to control her episodes, Audrey undergoes a series of tests and eventually becomes an in-patient at the Néréis institute, where she also learns about the myth of human-whale hybrids called Phallainas, which is told in a fresco on the institute’s walls (and is the fresco that was exhibited at FIBD). Audrey’s hallucinations will dramatically develop throughout the narrative, intertwining with the Phallainas myth, and with her re-emerging memories of possibly being experimented on at Néréis as a child. Ren explains that in Phallaina ‘tout est focalisé sur [Audrey’s] ressenti’ (FIBD 2015), and sound effects and music are used most notably and powerfully – most resonantly – throughout her seizures. We seem to see her hallucinations with her, but not to hear them – or rather we hear them differently, through a ‘hallucination theme’ that recurs and develops across her most serious and prolonged anxiety and epilepsy episodes. Referred to by Crombet (2017) as, variously, ‘lancinante’, ‘déchirante’, and ‘menaçante’ music, it is a theme that goes to crescendo and increases in intensity as more instruments join in. It starts with a repetitive high-pitched violin sound that is then joined by a second violin, percussion, and synthetic effects, creating together not a harmonious melody but an accumulation verging on dissonance. While there are key differences between the experience of scenes in which this resounds (and of Phallaina as a whole) and that of a film – as, owing to the comic’s interactivity, the user is in control of pace and scrolling direction – the ‘hallucination theme’ would seem to be a ‘conventional’ example of nondiegetic empathetic music, whereby sound echoes and amplifies ‘l’émotion de la scène’ (Chion 16). One way in which to nuance this, drawing on debates around the productivity of a diegetic/nondiegetic division in film studies, is to point out that this association of music and image is the ‘only manifestation’ of Audrey’s hallucinations, and that the fact that the music is not actually heard by her does not mean it cannot have an effect on the image ‘from within’ (Yacavone, original emphasis, 25–7).23 This hints at the potential for interconnectedness between sound (music) and image (the transformed but ‘recognisable’ comics element), and for resonance as a driving aesthetic and narrative force in Phallaina. We experience this, for instance, in a scene in which Audrey is undergoing a free-diving session as part of her treatment, and is being monitored by Chloé, a scientist at the institute, from a control unit on the side of the deep pool (chapter 11). Chloé puts on classical music, and this at first clearly diegetic sound becomes nondiegetic music whose harmony accompanies Audrey’s seemingly peaceful and joyful free-diving experience. When Audrey gets very deep, the classical music becomes distorted, as if slowed down, and Audrey raises her hands to her ears, visibly hearing something. The music morphs into the ‘hallucination theme’, which enriches itself and develops through an overlaying of sounds that verges on the chaos of dissonance. We hear the notes that have come to denote Audrey’s access to her past, as she sees herself above, free-diving as a little girl, as well as a child Chloé and her scientist father (who used to work at Néréis) watching her from the control unit. The sound of diving into the water occurs and reoccurs, becoming part of the layered and dynamic soundscape of Audrey’s episode. As her hallucination keeps progressing, the squares on the walls of the pool become lines and entangle themselves, the visuals dissolved and reshaped into abstraction to the sound of music that is morphing into distorted electronic sounds. As Audrey is finally taken back up to the surface, the hallucination and its music stop with the splash of her emerging from the water. Resonance enables us to go beyond seeing sound and image as rendering Audrey’s experience in this scene, and to view their interrelation as generative, triggering the intermingling of her memories and sensations to the point of auditory overload and visual morphing and dissolution. Music is here screen music, not in the sense of diegetic ‘musique d’écran’ as theorised by Chion (88), but as force and flux that permeates the screen. What I have called ‘dissemediation’, the heterogenerative interrelations of medial fragments, here in fact leads to inextricable and uncontrollable ‘welding’ (to use Chion’s term, 73) of sound and image through a dynamic of reduction of the audiovisual gap to the point of suffocation (‘j’ai manqué d’air’, says Audrey after she gets out of the water).24 For the experiencer, scrolling right means moving not only forwards but also deeper. The absence of panels, which elsewhere created fluidity, becomes suffocating entrapment due to the lack of interframe spaces as in-between breathing spaces. As Audrey is transpierced by sound and surrounded by image, they are stitched together not in correspondence but, for both Audrey and the experiencer, into a heterogeneous and shifting musicomic whole. Audrey’s last major episode (chapter 14) continues and expands the movements through which sound, image, and music disjunctively transform each other across Phallaina. Audrey has reluctantly agreed to undergo an experiment for Chloé, who is intent on disproving the theory that people with a physeter can understand whale language as modern-day Phallainas, descendants of the mythical union of whales and humans. Chloé intends to map Audrey’s brain activity while playing her a recording that she describes as a ‘son composé de clics’ (which we do hear). As we scroll, a spiky line (measuring MEG (magnetoencephalography) signals, and resembling sound waves) moves towards Audrey, passes through her (it is seen on her MEG helmet) and into the room. The image moves between these brain/sound waves, and the water that is now coming down the walls of the room. It is as if sound, as heard by Audrey, had materialised in the image, bringing on the arrival of water and the liquefaction of the visual. Stemming or taking over from this incompossible sound–image interconnectedness, the ‘hallucination theme’ starts resounding as the room gradually fills with water, and Phallainas come through the walls. The music is not verging on chaos as in the episode discussed above, but now gradually covers up and absorbs the sounds heard thus far in the scene. Its rhythm is relentless, as is the advance of the Phallainas into the room, rendered through parallax effects – even in an otherwise static image when the experiencer is not scrolling. The inextricability and uncontrollability of sound–image association in this scene is expressed through the unstoppable movement of audiovisuality: music both within and without the image, music and image both together and apart, resonating rather than cohering or corresponding. At the end of Phallaina, after this episode, audiovisuality will ‘open’ along with Audrey to the possibility of different realities. Audrey goes to the beach, enters the water, and interacts with the whale she sees, an encounter that is soundtracked by uplifting pop music. She comes to accept her hallucinations as sensation, and in this way to control the audiovisual materialisation of her epilepsy and anxiety attacks, by no longer resisting the call of the ocean that, as we were told in the Phallainas myth, ‘résonnait dans leur cœur un peu plus fort à chaque saison’ (chapter 8, my emphasis). If we follow Murch’s view with which we started this section, resonance only occurs a few times in Phallaina. However, the explosive aesthetic and narrative potential of sound–image interactions is a driving force of this ‘voyage immersif’ (Combret 2017), as they connect, converge, and diverge – resonating into intermedial and audiovisual musicomic eruptions as experiencers scroll, each at their own pace, deeper into Phallaina. Concerts de dessins, whose comics have been scripted by different cartoonists and whose music has each time been scored by Belkacem, usually gather an international team of comics artists. The five-piece band is led by Belkacem and has remained unchanged, with guitarist Yan Péchin, bassist Bobby Jocky, keyboardist Dondieu Divin, and drummer Patrick Baudin. The stage set-up typically (though there may, of course, be variations) consists of a table for the cartoonists on each side of the stage. The live drawing is filmed by an overhead camera and shown on a big screen, under which the musicians play in the middle of the stage, with Belkacem often sitting down and facing the screen with his back to the audience, appearing as both a conductor and a spectator. Each panel is drawn live by several cartoonists, in turn or at the same time. One musical piece is usually played per panel, and once it is completed, the progression of the act is shown on the screen, with the panel inserted in its place on the page. The finished bande dessinée is shown on the screen at the end of the performance, with its pages turned, as one would read a comic. Concerts de dessins were conceived to offer the festival’s bédéphile audience a different way of experiencing comics. Editorial manager and Asia coordinator Nicolas Finet explains that the idea was to turn ‘comics consuming into a live show’ (Comics Concert 2013). Comic art opens to the performative through ‘showing doing’, the ‘displaying doing’ (Schechner 2006: 28) of the creative dynamics of the work in-becoming. The audience is shown what they do not usually see, and in a way in which it does not usually occur – comics artist Alfred, in 2017, explains that what interests him is ‘le fait que ça n’a absolument rien à voir avec ce qu’est mon vrai quotidien d’auteur’ (Canteau 2017). While comic art needs to adapt to the stage to display a performance of its making, music is already a performing art – what it does here, transposed to the context of a comics festival, is turn to the comic, as visualised in the stage set-up. In this juxtaposed and collaborative live audiovisual intermedial creation, narrative and thematic links between music and comics are supplemented with their mapping onto each other as performing arts, in the staging of medial similarity (as physical gestures) and difference (as producing transient sounds and visible marks). There is of course a ‘liveness’ to this intermedial dialogue, and the festival website’s phrase (on the occasion of the 2014 edition) that the concert de dessins concept and tradition is a ‘matière vivante nourrie à chaud du dialogue fécond de la bande dessinée et de la musique’ (FIBD n.d.) is interesting in this regard. That there is a ‘fecund dialogue’ between the two media is, as we have seen, well established, and the idea of what I have called musicomic as a ‘matière vivante’ (as, in a sense, performative) is something that is arguably present in all the interactions we are considering. What interests us here is that it is displayed and staged in and as performance, enacted in time and space (‘à chaud’), with music combining and resonating with drawing that is here not only a noun, but also a verb. For the artists, music combines with drawing as an act, as gesture. Cartoonists generally talk about the influence of the music on the way they draw. For instance, Alfred in 2013 speaks of letting music ‘s’infiltrer dans la manière de dessiner’, in the sense that it turns into ‘quelque chose qui va jouer sur la manière de bouger la main, d’appuyer le pinceau’ (Mondomix 2013). Conversely, the musicians talk of how the score is really a script, thereby echoing a key aspect of understanding music as performance as theorised by Cook (2003: 206), and that during the concert there can be variability within structure as, in Péchin’s words, ‘l’intérêt c’est qu’on puisse suivre le trait, la sensibilité des dessinateurs’ (FIBD 2014). Live intermedial practice is, according to Joanne Scott, where ‘configurations and combinations exist in a precarious state and where each “movement” within the work represents a new iteration of intermediality’ (2016: 38–9), to which our concept of resonance brings a fruitful perspective. These new iterations of intermediality, and audiovisuality in our case, arise from the orchestration of the heterogenerative resonance between music and comics, and from the experience of it, the audience taking part in the bringing into being of the musicomic as transient and shifting, ephemeral and collective. Conceived as the soundtrack to the imagetrack in the scripted audiovisual narrative, the music is that of the fictional world that takes shape in front of the audience. Throughout the performance, in a process of live ‘dissemediation’ – potentially realised in different ways for each person in the room, and in retroaction, in the present, and in anticipation – musical aspects, attributes, and moments also interrelate with fragments of the drawing as noun and as verb: with the gesture making the mark (accompanying the hands that are seen on the edges of the screen); with the mark itself (the traces left by the gestures and that remain with a difference as they combine with the marks that we see being made); and with the blank that is getting filled (the multiplicity of potential that is not-yet-drawn). In the encounter of music and comics in and as performance, the immersive and fugitive music potentially combines – resonates, rather than coheres or corresponds – with gesture, mark, blank; with the comic in-becoming as already drawn, being drawn, to-be-drawn. This ‘open’ resonance within the time and space of the concert therefore contrasts with the dynamic of welding of sound and image that we saw with Phallaina. Let us take 2014’s L’Amour aveugle, based on a script by Jean-François Tripp and Albert and a musical score by Belkacem, as an example. The fourth and last performance on Sunday 2 February, which is the one I will be referring to here,27 gathered an international team of comics artists, with Tripp, Alfred, Régis Loisel, Richard Guérineau, Li Kun Wu, R. M. Guéra, Miroslav Sekulic-Struja (who is also a painter), and François Olislaeger (who has developed a sustained intermedial and performative practice throughout his career, in particular in dialogue with dance, contemporary art, music, and theatre). L’Amour aveugle tells an increasingly absurd story in which two men battle for the love of a visually impaired woman. It is useful here to differentiate between the songs with lyrics, and the instrumental pieces. The songs with lyrics, providing the comic-in-becoming with words it does not have, arguably initially function as an anchor to the panel in the making, their verbality and vocality focusing the experiencer’s attention. Moreover, a song with lyrics makes it easier for the audience to listen not only forward, expecting what will come next, but also backward, through a process of retroactive determination that echoes that of the reception of the drawing (on which see Daures 2013).28 The very beginning of the performance is interesting in this regard. As the cartoonists start on the first panel of the first act (‘la rencontre’), Belkacem sings-recites ‘L’Onde’, whose lyrics, in the neutral pronoun ‘on’, talk of love at first sight and of acting – or not – upon it. The music combines with the still mostly blank image, as a woman is being drawn in the centre. She is the one with whom someone falls in love, we expect, sound inviting us to fill the blank space. When a second man starts being drawn, what was an encounter between two people becomes the set-up for a love triangle. What is being drawn makes us see differently what was already drawn, and hear the music differently: the ‘on’ of the song, from neutral, may now be heard – and perhaps be sung – as plural, music and drawing following and leading each other in turn. Instrumental music can interact in different ways with the live drawing. While most of the panels end up being quite full, and with the whole band playing, one panel stands out because it retains a higher proportion of blank space, and its music is distorted electric guitar only. As the previous panel (a packed one of the scene of an explosion in a restaurant) was being finished, all the musicians stopped playing, apart from guitarist Yan Péchin. In contrast with what has occurred before in the performance, the drawing hand quickly traverses the blank page (rather than building up a drawing in a part of the panel), creating what seems like abstract bent lines with loops, and which becomes the tracks of a rollercoaster. Throughout the drawing of the panel, the guitar’s distorted sounds combine with the image to become sounds of motion, continuing when the comics artist is now focused on a corner of the image and drawing the characters (the woman and one of her suitors in an open car, the other man tied to the tracks). Music here seems to prolong the movement of the drawing gesture by repeating it with a difference, to animate the image not in the sense that the image itself moves but that it moves through sound. In concerts de dessins, within the time and space of the performance, drawing and music are staged as resonating, generating, and responding to each other in various ways for the artists and the audience members. Their encounter in and as performance is, to use Jnan Blau’s words, ‘embodied, scripted, put-on-display-for-an-audience, in-a-specific-context’ (7), in-becoming and in perpetual variation, live and ephemeral. The comic that is ultimately produced, its completion both the whole point and the disappearance of the performance, is not the musicomic that has been experienced (the shifting, transient, and multiple ‘musicomic’ brought into being by the collaborative orchestration of resonance). Rather, it is a remnant of the performance, a material trace of it, now silent and complete – while the performance itself may always happen again, starting again from silence and a blank page. In our investigation of what happens when music and comics are created and experienced together, where we have shifted from inextricable welding to a more ‘open’ resonance within the time and space of performance, we end with a type of encounter in which sound/image interrelations are more mobile still. In music-comics albums, the separation between the audio and the visual content allows for combinations that, while they can be more or less mapped out in the comic book and the music,29 are ultimately up to the experiencer. The reader-listener actively ‘dissemediates’ to create the intermedial audiovisual text when they actualise some of multiple potential sound–image interactions, and these do not become fixed but remain as possibilities and potentialities. Placed – each time anew, in (re-)discovery or with accumulated past experiences – in the generative in-between space, the reader-listener as synchroniser orchestrates sound/image resonance to create their own transient, dynamic musicomic. We will explore this in two contrasting examples, the first shaped by politico-aesthetic resonance, and the second inscribed in a searching experimental practice. Grange and Tardi’s N’effacez pas nos traces! was released for the fortieth anniversary of May 1968. As Matthew Screech has shown in his study of the portrayal of this event in bandes dessinées, Grange and Tardi’s project, similar to other comics descriptions of May 1968, offers an idealised view of it as a ‘mythical fantasy’. However, it redefines it as a ‘tale of universal significance’ and, importantly, dwells on ‘what the dominant mythology edits out: radical politics, striking factories, and police violence’ (2017). This approach is consistent with both artists’ oeuvres: Tardi, a major figure in bande dessinée since the 1970s, and Grange, a key singer-songwriter of chanson engagée who was directly involved in May 1968, are well known for their political engagement. Tardi’s comic is divided into fifteen chapters that follow Grange’s fifteen songs, the title of each chapter the same as the title of the corresponding song on the CD. Four of the songs were first written and performed by Grange during 1968–1970, and two others are covers of songs related to the 1871 Paris Commune, thereby inscribing May 1968 in a revolutionary tradition. The themes of the remaining nine songs, written between 2005 and 2007, reflect Grange’s constant left-wing political engagement against fascism and inequality. The music-comics album ends on a song-chapter reacting to Nicolas Sarkozy’s 2007 statement that the time had come to turn the page on May 1968, and it calls for remembering and continuing the fight rather than erasing the revolutionaries’ traces. As the reader-listener is called upon to synchronise sound and image in song-chapters that combine a track of several minutes and a comic of a few pages, this may considerably slow down the reading process. Therefore, as noted by Hague, rather than trying to ‘keep up’, we are instead ‘encouraged to linger over the images, absorbing the messages of the work both visually and aurally’ (79). The concepts of dissemediation and resonance enable us to explore this in more depth. Indeed, we are encouraged, I would add, to scatter our approach to the comic and the music, viewing them anew through dissemediation. We view them anew as, in fact, the (aesthetic, narrative, political) rhizomatic potential that they already are – the comic as, to borrow experimental comics artist Alexandre Balcaen’s phrase, a ‘tableau fragmenté’ (8), and the music, to draw on Cook, as ‘bundles’ or ‘collocations’ (2001). From there, we reassemble them into musicomic, here in an act of audiovisual and intermedial historico-political remembrance. In N’effacez pas nos traces! dissemediation in and through interconnectedness is realised in the context of a music–comics interaction that is emphatically not shaped by dissonance between its elements, but rather by consonance in the construction of a coherent audiovisual political message. Resonance enables us to go beyond looking at this as sound–image correspondence, shifting our focus to what occurs dynamically from the generative space of the gap(s), in the (open, transient) interrelations of fragments, attributes, aspects, and/or moments. Difference as positive is part and parcel of the experience, dissimilarity part and parcel of similarity, when, for instance, indexical signs interrelate as words that are sung and words that are drawn; or mise en page and song structure, the grain of the voice and the graphic trace. Let us take, for example, the song-chapter ‘Le Sang’ (30–3), which is almost five minutes and only four pages long. This calls on the reader-listener to move away from a linear, narrative-driven reading, and instead to map possible connections between sound and image. ‘Coquelicot de la chanson, éclaboussures sur le poteau’, the lyric which opens the song, features in a récitatif in the fourth, rather than the first panel, in a productive mismatch between the song’s and the comic’s linear progression, inciting us to look across the double page. The sixth panel shows a red sea and a lighthouse, visually echoing not only the reference to the Breton island of Ouessant featured in the text, but also the earlier lyric ‘ça se confond dans la mer Rouge’. ‘Le sang’ comes back as a refrain throughout, a repetition echoed by the omnipresence of blood in the non-fugitive (to draw on Groensteen, 1999: 183) comic images, as the colour red, present in all the panels, is always in the corner of the synchroniser’s eyes. In another song-chapter, ‘Les Nouveaux Partisans’ (56–9), which is four pages and just under four minutes long, rhetorical, musical, and graphic strategies echo, prolong, and shift each other to reinforce the political message. In the song, first released in 1970, Grange warned the bourgeoisie of an upcoming revolution from the ‘new partisans’ among the exploited working class. The version in N’effacez pas nos traces! retains the contrast between verse and chorus as analysed by Eric Drott (2011). In the verses, the vocal delivery is rapid and the musical rhythm compressed, as the singer calls for the bourgeoisie to face the numerous abuses they have imposed on the working class. The chorus has a ‘greater sense of rhythmic flow’, and the song transitions from the ‘declamation’ of the verses to a revolutionary refrain. In this version, male backing vocals accompany Grange’s voice, representing the partisans (Drott, 76–9). In Tardi’s visuals, the defiant ‘Ecoutez nos voix’ is supplemented with characters directly facing the experiencer, as if demanding to be looked in the eye as well as listened to. The panels show factory workers and miners, alternating in focus between groups and individuals, in this way both personifying the abuses done to the working class, and showing the ‘masses’ of new partisans that will rise against the bourgeoisie. This echoes Grange’s position as a spokesperson in the verses, and the broader collective working-class voice found in the chorus, as sound and image diversify and supplement each other. The experience of this music-comics album is shaped, in part, by the perception of distinctive and recognisable subjectivities, in terms of voice (which, as already evoked in this article through the notion of ‘vococentrism’, has the power to focus the listener’s attention) as well as graphic style. Grange’s voice, with its earnest, emotive tone, inflections, and delivery, inhabits the words she sings. Her performance combines with Tardi’s personal vision, in gouache images with, in places, expressionist qualities, in which bold colours are juxtaposed with greys and browns, levels of iconicity vary, backgrounds are sometimes blurred and fading, with faces often not detailed but almost sketch-like. To examine this and end our overview of politico-aesthetic resonance in N’effacez pas nos traces!, I wish to reflect further on the guiding idea of ‘trace’ by drawing a connection between the Barthesian concept of ‘le grain de la voix’ and Philippe Marion’s theorisation of ‘graphiation’. The grain of the voice is defined as ‘le corps dans la voix qui chante, dans la main qui écrit, dans le membre qui exécute’ (Barthes, 1441), the unique quality of a voice that carries the material trace of the body; the graphiateur is the abstract agent that left traces on the comic pages of its graphic gesture, which is in turn perceived and recreated by the reader (Marion 1993, Baetens 1996).30 The perception of highly individualised vocal and graphic utterances in N’effacez pas nos traces! may therefore be seen to stem from the perception of the traces of the body in the (recorded) voice, and the graphic traces left on the comic pages. This is not to follow an author-oriented reading (on which, in relation to ‘graphiation’, see for instance Baetens, 1996), as these are traces of a non-origin, echoing a Derridean understanding of the term.31 Rather, it is to say that the experiencer can potentially perceive interrelations (all interrelations are potential, as we have seen) between voice and graphic style. As such, they may orchestrate their resonance by taking up the traces of, and in fact creating, audiovisual subjectivity/ies (that may well be shaped in part by extra- and intertextual knowledge of both artists’ work and lives) that address and interpellate them – call upon them to remember, personally and/or culturally. This is another way in which the reader-listener can be drawn in further to orchestrate politico-aesthetic resonance between sound and image, in a process that triggers a musicomic act of remembrance to inscribe May 1968 in a ‘timeless story: humanity’s fight for justice’ (Screech 2017). This is a story in which ‘chacun de nous est concerné’, to adapt the title of Grange’s 1968 song, of which a new version is included here. While in N’effacez pas nos traces!, narrative, voice, and text can guide the reader-listener in their sound–image associations, Baladi and Ghostape’s Charge combines its forty-eight-page wordless visuals with an irregular layout (Figure 1), and an instrumental electronic soundtrack of just over thirty-seven minutes that is not divided into tracks. It is a music-comics album as a site for experimentation, leading to the reader-listener’s searching, deciphering, and associative synchronising experience. Baladi and Ghostape, who are both Swiss, have been part of the Genevian independent cultural scene. Ghostape, whose output ranges across musical genres, describes himself as a ‘bidouilleur de son’ (cd1d n.d.). Baladi, who has won the Prix Töpffer Genève twice, is notably a member of the Oubapo (Ouvroir de bande dessinée potentielle), one of the Ou-X-Po groups deriving from the OuLiPo (Ouvroir de Littérature Potentielle), co-founded by Raymond Queneau and François Le Lionnais in 1960. © Baladi & La Cafetière, 2006. Charge was published by independent French comics publisher La Cafetière, as the first in their ‘Morceau’ collection of music-comics albums. La Cafetière, who in 2016 joined the Syndicat des Editeurs Alternatifs (on which see Groensteen 2017: 61), is part of a bande dessinée landscape that since the 1990s has seen the ‘emergence of a whole new sector of small alternative publishers which opened up a space for a non-commercial, autonomous area of work defying mainstream norms in terms of both format and subject matter’ (Miller, 49). Charge and the other music-comics albums in the Morceau collection are inscribed in an experimental practice exploring the possibilities offered by the medium of comics, here in its interaction with music. This is encapsulated by the phrase used to describe the collection, ‘il n’y a pas de barrières, seulement des ponts à franchir’,32 which brings us back to the idea of audiovisuality and intermediality as ‘bridging over’. 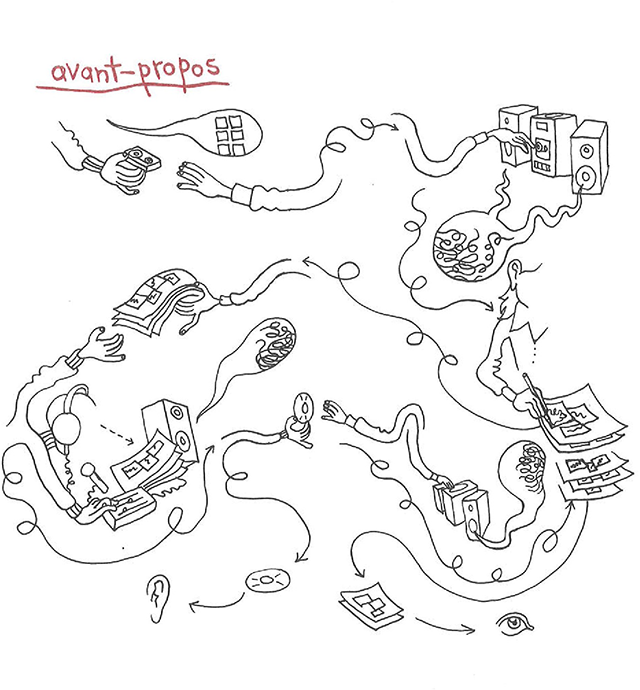 The foreword of Charge offers an overview in comic form of the collaborative process between Baladi and Ghostape, and of sound–image interactions developing in the creation of the album (Figure 2). It starts with the musician handing a tape over to the comics artist, with a speech balloon pointing at Ghostape containing a blank waffle-iron grid, the music not having been given visuals yet. Baladi hears Ghostape’s music as visual sounds, represented by scribble-like shapes coming out of the speakers in a speech balloon, which he then transposes to the page in comic form. Music and comic pass back and forth between the two artists, with the page divided into music on the left and visuals on the right, linked by sinuous rather than straight arrows, implying a process of creativity rather than of direct equivalence. At the bottom of the page, the final product is divided into two separate objects, a CD pointing to an ear and comic pages pointing to an eye, before hearing and seeing are combined in the reader-listener’s experience. Described by the publisher as an ‘univers en construction/déconstruction’ (back cover), Charge centres around transformation and transmutation. It opens with the scribbles seen coming out of the speakers in the foreword, resembling dark clouds and dripping into black disc shapes made of concentric circles, echoing vinyl records. These discs travel to an urban landscape, where they combine with organic matter such as worms, produce clouds of white fog that descend on the city, and gradually melt everything, eventually turning this urban landscape (shaped by human intervention, but in which we never see people) into something resembling mountains and then the sea. After a storm, morphing scribble-like shapes rise, and again melt and morph to turn into what resembles trees, nuclear mushroom clouds, or a waterspout, before the comic ends on a seemingly stabilised landscape. With its disc shapes resembling vinyl records and ‘charging’ at and morphing the city, Charge can be perceived as materialising the transformative potential between sound and image that we have seen across our case studies. Furthermore, it creatively echoes an understanding of both soundscape and landscape as text (Smith 1994), as ‘simultaneously a physical environment and a way of perceiving that environment’ (Thompson 2004: 1). The experiencer is called upon to ‘read’ the environment they are audiovisually entering and in which they are immersing themselves. It is up to them to make their own sense of the interrelations between – to orient themselves in – a fragmented graphic landscape that draws on the polysemy of a wordless comic, and a bundled electronic soundscape that is made up partly of cut and mixed sounds, including noises that the experiencer can spatially structure as sounds produced by the different elements on the page, such as insect sounds. The experience of Charge would therefore seem to be centred on finding correspondence and the ‘correct’ match between sound and image. Resonance, as a process going beyond a binary opposition between sound/image harmony and chaos, enables us to suggest instead that the ‘totale adéquation’, as expressed by the publishers (back cover), between music and comics is in fact potentially multiple, each synchroniser taking an active part in the de/reconstruction of the sound-landscape and the text’s audiovisuality. The reader-listener may wonder at times if they are ‘on the right page’ (the risk of ‘ne rien comprendre’ is mentioned in a Livre du monde review); yet, as they look for sounds and listen for shapes in roaming (rather than simply in error or accurately), they are also fugitively creating the sound-image of Charge. As experiencers play with synchronisation, they experiment with sound-image associations not in exclusion but in permutation, creating what we may call, drawing on Deleuze, ‘ou bien/ou bien’ (1969: 204) alternatives,33 and there is a generative disjunction between music and comics. Incompatibility gives rise to compatibility, as a transient and potentially irrational and asymmetrical musicomic whole stems from unfinal sound/image incompossibilities. As such, Charge appears as a site of experimentation not only for the artists but also for the synchroniser, as the multiplicity and explosive potential of sound–image interactions are at the forefront of the experience, in an open and dynamic process of dissemediation/reassembling. Both N’effacez pas nos traces! and Charge thus show us, in comparable and contrasting ways, innovative and varied practices and processes in which music and comic art, and more specifically recorded music and comic book, can interact, calling upon the reader-listener to orchestrate their resonance and create their own fluid intermedial and audiovisual text – their own musicomic – for the first time, or again and anew. The guiding inquiry of this article has been about what happens when comics and music are created and experienced together. This has led us to examine inextricable audiovisuality verging on suffocation before it opens to the possibility of different realities in Marietta Ren’s Phallaina, as the experiencer scrolls deeper into hallucination as sensation. We then turned to the staging of music and comics as performing arts in Concerts de dessins, ephemerally generating and responding to each other for artists and audience members alike and differently. We ended with the synchronisation of sound/image potential, in the politico-aesthetic retracing and remembrance of May 1968 in N’effacez pas nos traces!, and the (dis)orienting experience of de/reconstructing the sound-landscape of Charge. The intermedial audiovisual dialogues between comic art and music that we have explored participate in a broader cross-media practice that experiments with the gap(s), transmutations, and echoes of sound-image and medial hybridity. As such, they contribute to expanding our understanding of audiovisuology, a field in which music has been a nexus of analysis but whose complex and productive interrelation(s) with comics has remained largely unexplored. This is in part, of course, because comics is a ‘soundless’ medium; yet, as we have seen, its history has been traversed by off-the-page sound–image encounters – an audiovisuality that keeps developing today in particular through comics’ transition into digital culture. The concept of ‘resonance’ and, circulating around it, ‘dissemediation’ and ‘musicomic’, have enabled us to investigate the explosive potential of music–comics encounters as multiplicity. The idea of intermedial and/or audiovisual bridging of gaps is fruitfully reconfigured through resonance, which, following Deleuze and Guattari, makes us understand bridges as ‘carrefours’ and ‘détours’ – as ‘ponts mobiles’ (1991: 28). They are here talking about resonance between concepts as part of their reflection on what philosophy is; as we have seen, when brought into contact with music–comics encounters this helps us explore audiovisuality and intermediality as occurrence, with movements stemming from heterogenerative gap(s) and building transient bridge(s), in a dynamic process of dissemediation/reassembling into a new shifting whole. The suggestiveness – and, as we saw, broad applicability – of resonance as a concept gives rise to a flexible critical framework through which music–comics interactions can be posited and theorised as a rich field of intermedial practice. This, I would argue, in turn contributes to the transdisciplinary conceptual creation of resonance, its being as becoming through new, productive, and open-ended connections. This article has begun to approach the breadth of music–comics encounters, with no aim at exhaustivity, and with the hope that wider implications and applications may be drawn, some of which I will gesture towards in this conclusion. Throughout we have focused on multimedia works, shifting the perspective away from ways in which comics are like, or can render, music. To return to these anew, I would suggest that resonance can apply to our understanding of intermedial references and transpositions in the interplay between images drawing sound, and imaged and imagined musical sounds.34 The music that emerges here as it is imagined by the reader may be intermittent, constant, fragmented, sharp, or distant; as it stems from the page on which it is visualised or that it infuses, it may resonantly come to the fore – and the bande dessinée canon provides us with an evocative explosion of (imagined) sound and image, with La Castafiore’s resonant shattering of glass. In relation in particular to comics adaptations of pre-existing music, we may now come to see ‘palimpsestuous resonance’ in the to-ing and fro-ing between musical and graphic texts.35 Julie Sanders has already posited music as offering ‘one highly applicable and suggestive set of metaphors and idioms’ for the study of adaptation and appropriation (2006: 12), talking in particular of sampling – in terms that find an evident echo with our understanding of resonance – as the ‘purposeful reassembly of fragments to form a new whole’ (2006: 4). The questions we have explored throughout – of gap(s), bridge(s), generative difference, dissimilarity as part and parcel of similarity – are fertile also to view adaptation as resonant movements of open-ended, shifting interrelations that dissemediate and reassemble texts (‘fluid texts’, to draw on John Bryant: 2013) across language, time, and/or media, that shape and reshape rhizomatic inter/textual networks. If following on from adaptation we shift further from intermediality to transmediality, we see that resonance may occur ‘across’ as well as ‘between’. We can take our cue here from comics artist-musician Renard, who uses the term to refer to the interrelation between comics and performance in his Melvile universe, which tells the simultaneous stories of the inhabitants of the town. In Renard’s words, ‘le spectacle est une résonnance de la bande dessinée ou la bande dessinée est une résonnance du spectacle’ (Mac Arthur 2014); we may fruitfully extend this to the universe as a whole. Its interconnected elements (music-comics albums, apps, performances), themselves heterogeneous wholes, are both highly coherent and disseminated, convergent and divergent. The bande dessinée series is both the core of the universe, and now its decentred non-origin as one perceptual form of its transmedial narrative(s). In this protean universe, medial and modal boundaries are being crossed back and forth, rhizomatic connections forming, multiplying, and differing with each experience.36 This gives us another sense of the (aesthetic, narrative, experiential) potential of music and comics in resonance, here as part of a transmedial practice. Broader implications arise beyond our fruitful focus on music–comics encounters. If resonance logically lends itself particularly well to audiovisuality, looking beyond correspondence and coherence to explore the multiplicity of interrelating heterogeneous wholes of fragments, and the triggering of new, transient, shifting wholes, is productive too for other medial encounters – in open-ended variations of combinations between artforms such as dance, architecture, theatre, sculpture, or opera. In the end, resonance in fact takes us back to the media in themselves, to their inherent potential for dissemediation and reassembling across experiences and contexts. It returns us anew to comic art as ‘art du rapiéçage’ of heterogeneous fragments, to borrow Balcaen’s phrase (original emphasis, 8), and to music as ‘an interaction of autonomous agents, as emergent – in short, as structured in much the same way as multimedia’, to draw on Cook (2001: 192). If intermediality and audiovisuology are trans-disciplines, then resonance is a concept for looking between and across, within and without texts, as we investigate, experience, and experiment with the multiplicity of media as apart from and part of each other, such as when music and comics in resonance become musicomic. 1See also See this Sound’s parallel online platform: http://www.see-this-sound.at/en. 2Music–comics cross-pollination is only mentioned in reference to Cathy Berberian’s 1966 Stripsody (Shaw-Miller 2015: 481–2), to which I will return briefly below. Sound–comics interactions are also largely absent, for example, from the 2013 Oxford Handbook of New Visual Aesthetics, which includes a chapter on ‘the sound of the superhero’ but with a focus on ‘comic book films’ (Halfyard 2013). 3On music and visual culture, see Shephard and Leonard (2014); on intermedial ‘music’ culture, see Arvidson et al. (55–136); and on musical multimedia, see Cook (1997). On comics’ intermedial dialogues, see, for instance, on cinema, Boillat (2010); on literature, through the lens of adaptation, Tabachnick and Saltzman (2015); on fine arts, Beaty (2012) and Frey and in ‘t Veld (2016); on architecture, Labio (2015). It should be noted that comic art is generally seen as intermedial in itself due to its combination of word and image (except in the case of wordless comics) (see, for instance, Rajewsky, 51), though of course ‘all media are mixed in different ways’ (Elleström, 24), and intermediality broadly conceived therefore stands as a trans-discipline relevant to all media. 4I mean ‘soundless’ here in the sense of without a soundtrack, though comics do of course generally have a visual soundtrack. Ian Hague (2014) has challenged the view of comics as almost exclusively visual in his multisensory approach to the medium. In addition to discussing sounds with and in comics (which broadly corresponds to my approach here, though I focus more specifically on music), he also explores the reading process of ‘seeing with the ear’. 5Christian A. Bachmann (2016) analyses the strong presence of music in cartoons and early comics through to the contemporary context, in relation to the idea of ‘the power of music’, a ‘staple in Western thinking’ since antiquity. 6On musical notation in comics, see Brown (2013). 7For an overview of techniques used to render music in comics, see Bouchard (2009). 8Edmond Baudoin should be mentioned here, as he has continuously reflected on the relationship between drawing (rather than specifically drawing comics) and music, for instance in his 2005 La musique du dessin (Actes-Sud – L’An 2). 9Hillary Chute (2013) echoes the emphasis on the part played by the reader in the actualisation of the comic’s rhythm. Whereas Ware thinks of it in terms of a reading process that is akin to reading or playing music, Chute contrasts it with listening to music, comparing it instead to reading poetry: ‘like written poetry, but unlike music and film, comics gestures at rhythms of attention, but leaves the final moment of engagement up to the reader’. 10The relationship between linearity and tabularity was first explored by Fresnault-Deruelle (1976), and then developed notably by Peeters (1991). 11While the metaphor of ventriloquism is particularly well suited to the discussion of cinematic voices and bodies (see, for instance, Connor 2000), Altman uses it to refer more broadly to the soundtrack’s relationship to the imagetrack. 12The expression ‘perceptual roughening’ is borrowed from Thompson (120). 13Rebecca Coyle further points out that it is the level of abstraction of the medium of animation that ‘offers a particularly malleable and potent form for sonic exploration, given the way sound exploits motion, time and space’ (5). Daniel Merlin Goodbrey, who is also a practitioner, is a key theorist of the digital transition that comics are currently undergoing. For an analysis of the ways in which the digital format enables comics to appropriate ‘tropes from other screen-based media’, see Goodbrey (2013); on game comics, whereby sound–image relations could be fruitfully compared to that in videogames, see Goodbrey (2015). 14See Chapple and Kattenbelt (2006). On intermediality as in-between, see also Sluijs and Smelik (179). 15This quotation from Elleström is cited by Nelson (14). 16For instance, Chapple and Klattenbelt define theatre as ‘a hypermedium that incorporates all arts and media and is the stage of intermediality’ (20). 17On the relationship between intertextuality and intermediality, see, for instance, Rajewsky (47–8). 18This is a term whose merging mirrors W. J. T. Mitchell’s ‘imagetext’, which in Jeet Heer and Kent Worcester’s words in A Comics Studies Reader ‘remains useful in highlighting the hybrid nature of comics and related forms’ (102). On the imagetext, see, in the same volume, Mitchell’s essay ‘Beyond Comparison’. 19This echoes Deleuze’s theorisation, in relation to modern art cinema, of the asymmetrical and irrational relationship arising from the disjunction between the sound image and the visual image as autonomous elements, constituting the audiovisual image (1985: 334). 20On ‘paradoxes of innovation’ in French digital comics, see Baudry (2018), who mentions Phallaina as an example of digital experimentation (17); for a discussion of the ways in which Phallaina redefines the comics medium, see Crombet (2017). 21See the Phallaina website at http://phallaina.nouvelles-ecritures.francetv.fr/. 22On the question of the ‘ruban d’images infini’ as ‘une “forme idéale”’ in comics, and for a discussion of Scott McCloud’s enthusiasm for digital comics in this regard, see Groensteen (2011: 80–1). 23On the diegetic/nondiegetic debate in film studies see Stilwell 2007 (who talks of the ‘fantastical gap’ between diegetic and nondiegetic) and Winters 2010 (who talks of the ‘nondiegetic fallacy’). Stilwell’s theorisation of the ‘fantastical gap’ in terms of both geography and physics (in the sense of a ‘change of state’), recognising ‘complication and change’ (2013: 126), echoes the conception of audiovisual and intermedial gap(s) discussed in this article. The diegetic/nondiegetic division is arguably more porous in animation, which has led Daniel Goldmark to argue that they are terms which ‘can be helpful for analyzing particular situations in cartoons’ but ‘fail to take into account that music is far more integral to the construction of cartoons than of live-action films because the two forms are created in completely different ways’ (4). 24The idea of suffocation (‘une impression suffocante pour le lecteur’) is also present in Hélène Crombet’s analysis (2017), in relation specifically to the scene to which I will turn next. 25We should note here that concert de dessins is a FIBD trademark, and the name usually given to a comics-music performance is concert dessiné, which refers to a broader range of practices. In addition to music and comics that are scripted and performed together as original creations, it refers to cases in which graphic artists provide a live illustration, or perhaps rather adaptation, of a concert – in fact in his analysis of ‘le dessin vivant’ Pilau Daures (2013) uses the term to refer to this only. There are also concerts dessinés where an album pre-exists the performance and is then adapted into live drawing. 26For a contextualisation of Winsor McCay’s practice in the history of comics performances, see Herd (2013). 27It is important to note that I am relying on a recording of this performance (available to watch at https://www.youtube.com/watch?v=QUmjgpiCbQs&t=1218s) and as such on a ‘mediatized performance’ (Auslander 2008). 28Looking more broadly at the practice of ‘dessin vivant’, Daures (2013) notes the similarity between experiencing the live drawing of an image and reading a comic, a process, as theorised by Groensteen, potentially shaped by retroactive determination. Daures notes that while in a comic this is shaped by ‘addition spatiale’, in a performance there is ‘addition temporelle’ of elements as the image is taking shape. 29There may, for instance, be chapters corresponding to tracks (such as with Renard’s Melvile, in which the soundtrack is also timed to a reading pace of around thirty seconds per page), or with the inclusion of the song lyrics in the book (as in Blain and Carlotti’s La Fille, where they feature on the opposite page of the wordless comic, along with the script). 30Baetens, in his development and critique of Marion’s ‘graphiation’, does not refer to the grain of the voice, but mentions Barthes’ theorisation of ‘style’ and ‘écriture’ (231). 31See, for instance, in De la grammatologie: ‘la trace n’est pas seulement la disparition de l’origine, elle veut dire ici […] que l’origine n’a même pas disparu, qu’elle n’a jamais été constituée qu’en retour par une non-origine, la trace, qui devient ainsi l’origine de l’origine’ (Derrida, 90). 32See the page on the Morceau collection on La Cafetière’s website at https://www.lacafetiere.org/product-category/morceau/. 33In Arnaud Villani’s words, ‘le ou bien/ou bien est cette foule de prétendants virtuels qui se pressent dans la forme à venir et, une fois pris dans un actuel, ne cessent de l’agiter encore en tous sens’ (310). 34On musical imagery, see, for instance, Inge Godȼy and Jȼrgensen (2001). 35For example, Linda Hutcheon sees adaptations as ‘inherently “palimpsestuous works”’ (6) and talks of ‘a conceptual flipping back and forth between the work we know and the work we are experiencing’ (139). 36The experiencer can in fact contribute to constructing the universe from within by submitting ideas for new stories to be included in the app, as part of the development of this auteur-driven practice through collaboration (with musician Jean-Christophe Carrière, creative studio Dirty Monitor, augmented reality agency Clap!, the Technocité students who worked on the video game), turning Melvile into a ‘réceptable à histoires’ (Gianati and Perround 2016). Arvidson, Jens and others. Changing Borders: Contemporary Positions in Intermediality. Lund: Intermedia Studies Press, 2007. Bachmann, Christian A. ‘The Representation of Music and Musicians in Caricatures and Early Comics (1830–1930): Three Case Studies’. Comics Forum, 24 June 2016. https://comicsforum.org/2016/06/24/the-representation-of-music-and-musicians/ Accessed 6 April 2018. Baetens, Jan. ‘Sur la graphiation: une lecture de Traces en cases’. Recherches en communication, 5: 223–35, 1996. Baladi and Ghostape. Charge. Paris: La Cafetière, 2014. Balcaen, Alexandre. Manifeste. Paris: Adverse, 2016. Barthes, Roland. ‘Le Grain de la voix’. In: Marty, Eric (ed. ), Œuvres complètes, II: 1436–42, 1994. Paris: Seuil. Beaty, Bart. Comics versus Art: Comics in the Art World. Toronto: Toronto University Press, 2012. Blau, Jnan. ‘More than “Just” Music: Four Performative Topoi, the Phish Phenomenon, and the Power of Music in/and Performance’. Trans. Revista Transcultural de Música, 13: 1–8, 2009. Boillat, Alain (ed.). Les cases à l’écran: bande dessinée et cinéma en dialogue. Geneva: Georg, 2010. Bouchard, Eric. ‘Musique sans sons 1 et 2’. Le Délivré, 23 November 2009. http://www.librairiemonet.com/blogue/2009/bande-dessinee/musique-sans-son-1/ and http://www.librairiemonet.com/blogue/2009/bande-dessinee/musique-sans-sons-2/ Accessed 5 February 2018. Brown, Kieran. ‘Musical Sequences in Comics’. The Comics Grid: Journal of Comics Scholarship, 3(1): 1–6, 2013. Bryant, John. ‘Textual Identity and Adaptive Revision: Editing Adaptation as a Fluid Text’. In: Bruhn, Jørgen, Gjelsvik, Anne and Frisvold Hanssen, Eirik (eds. ), Adaptation Studies: New Challenges, New Directions, 47–68, 2013. London: Bloomsbury Academic. Canteau, Damien. ‘Les concerts de dessins 2017: hommage à Hermann’. Comixtrip, January 2017. https://www.comixtrip.fr/dossiers/festival-angouleme-2016-2/les-concerts-de-dessins/ Accessed 25 June 2018.
cd1d. ‘Ghostape: biographie’. n.d. http://cd1d.com/fr/artist/ghostape/biography Accessed 26 June 2018. Chapple, Freda and Kattenbelt, Chiel (eds.). Intermediality in Theatre and Performance. Amsterdam: Rodopi, 2006. Chapuis, Théo. ‘Avec Phallaina, la première “bande défilée”, la BD s’adapte à la tablette’. Kombini, 2016. http://www.konbini.com/fr/entertainment-2/phallaina-bande-defilee-tablette/ Accessed 26 June 2018. Chion, Michel. L’audio-vision: son et image au cinéma. 4th ed. Malakoff: Armand Colin, 2017. Chute, Hillary. ‘Secret Labor: Sketching the Connection between Poetry and Comics’. Poetry, July/August 2013. https://www.poetryfoundation.org/poetrymagazine/articles/70022/secret-labor Accessed 9 February 2018. ‘Comics Concert – Hong Kong Arts Centre 2013’. 2013. https://www.youtube.com/watch?v=uh3Y79ROBN8 Accessed 22 June 2018. Connor, Steven. ‘Sounding out film’. 2000. http://www.stevenconnor.com/soundingout/ Accessed 7 April 2018. Cook, Nicholas. Analysing Musical Multimedia. Oxford: Clarendon Press, 1997. Cook, Nicholas. ‘Music as Performance’. In: Clayton, Martin, Herbert, Trevor and Middleton, Richard (eds. ), The Cultural Study of Music: A Critical Introduction, 204–14, 2003. New York and London: Routledge. Coyle, Rebecca. ‘Introduction. Audio Motion: Animating (Film) Sound’. In: Coyle, Rebecca (ed. ), Drawn to Sound: Animation Film Music and Sonicity, 1–22, 2010. London: Equinox. Crombet, Hélène. ‘Phallaina, un voyage hallucinatoire à travers une bande dessinée numérique’. Revue française des sciences de l’information et de la communication, 12, 2017. http://journals.openedition.org/rfsic/3397 Accessed 18 June 2018. Daniels, Dieter and Naumann, Sandra (eds.). See this Sound: Audiovisuology. Cologne: Walther König, 2015. Daures, Pilau. ‘Le dessin vivant’. du9, October 2013. https://www.du9.org/dossier/le-dessin-vivant/ Accessed 22 June 2018. Daures, Pilau. ‘Rock Strips: notes de (re)lecture’. du9, June 2013. https://www.du9.org/chronique/rock-strips/ Accessed 5 February 2018. Deleuze, Gilles. Cinéma 2: l’image-temps. Paris: Minuit, 1985. Deleuze, Gilles. Logique du sens. Paris: Minuit, 1969. Deleuze, Gilles and Guattari, Félix. Qu’est-ce que la philosophie? Paris: Minuit, 1991. FIBD. ‘Concerts de dessins’. n.d. http://www.bdangouleme.com/407,concerts-de-dessins Accessed 22 June 2018. FIBD. ‘Concerts de dessins’. n.d. ‘Actu du Fauve – Préparation du Festival 2016, la fresque interactive Phallaina’. 2015. http://www.bdangouleme.com/830,actu-du-fauve-preparation-du-festival-2016-la-fresque-interactive-phallaina Accessed 22 June 2018. FIBD. ‘Concerts de dessins’. n.d. ‘Dans les coulisses des concerts de dessins 2014’. March 2014. https://www.youtube.com/watch?v=DvESpna1z-o Accessed 25 June 2018. Flynn, Margaret. ‘Pour une histoire continuée des écrivains-cinéastes’. Revue critique de fixxion contemporaine, 7, 2013. http://www.revue-critique-de-fixxion-francaise-contemporaine.org/rcffc/article/view/fx07.01/782 Accessed 2 February 2018. Frey, Hugo and in ‘t Veld, Laurike (eds.). ‘Comics and Fine Art’. Special issue of European Comic Art, 9(2), 2016. Gianati, L. and Perroud, A. ‘Melvile est un réceptable à histoires’. BDgest, February 2016. https://www.bdgest.com/news-1061-BD-Melvile-est-un-receptacle-a-histoires.html Accessed 10 July 2018. Grange, Dominique and Tardi, Jacques. 1968–2008… N’effacez pas nos traces!. Tournai: Casterman, 2008. Groensteen, Thierry. La bande dessinée au tournant. Brussels: Les Impressions Nouvelles, 2017. Groensteen, Thierry. Système de la bande dessinée, volume 2: Bande dessinée et narration. Paris: Presses Universitaires de France, 2011. Halfyard, Janet K. ‘Cut the Big Theme? The Sound of the Superhero’. In: Richardson, John, Gorbman, Claudia and Vernallis, Carol (eds. ), The Oxford Handbook of New Audiovisual Aesthetics, 171–93, 2013. Oxford: Oxford University Press. Heer, Jeet and Worcester, Kent (eds.). A Comics Studies Reader. Jackson, MS: University of Mississippi Press, 2009. Herd, Damon. ‘Comics and Performance: From “Chalk Talks” to “Carousel”’. Comics Forum, 21 August 2013. https://comicsforum.org/2013/08/21/comics-and-performance-from-chalk-talks-to-carousel-by-damon-herd/ Accessed 18 June 2018. Inge Godȼy, Rolf and Jȼrgensen, Harald (eds.). Musical Imagery. New York and London: Taylor & Francis, 2001. Kattenbelt, Chiel. ‘Intermediality in Theatre and Performance: Definitions, Perceptions and Medial Relationships’. Cultura, Lenguaje y representación/Culture, Language and Representation, 6: 19–29, 2008. Lambert, Aude. ‘Marietta Ren, la dessinatrice qui réinvente la BD sur smartphone’. Cheek Magazine, February 2016. http://cheekmagazine.fr/geek/marietta-ren-phallaina-bande-defilee/ Accessed 26 June 2018. Lavender, Andy. ‘Digital Culture’. In: Bay-Cheng, Sarah and others (eds. ), Mapping Intermediality in Performance, 125–34, 2010. Amsterdam: Amsterdam University Press. Livre du monde. ‘Morceau collection: Charge’. Livre du monde, November 2007. http://www.livredumonde.fr/Morceau-collection-Charge Accessed 6 July 2018. Mac Arthur. ‘Interview de Romain Renard – Melvile, plus qu’une bande dessinée’. BDthèque, 16 February 2014. https://www.bdtheque.com/interview-romain-renard-melvile-plus-qu-une-bande-dessinee-283.html Accessed 20 June 2018. Marion, Philippe. Traces en cases: travail graphique, figuration narrative et participation du lecteur (essai sur la bande dessinée). Louvain-la-neuve: Academia, 1993. Miller, Ann. Reading Bande dessinée: Critical Approaches to French-language Comic Strip. Bristol: Intellect, 2007. Mitchell, W. J. T. ‘Beyond comparison’. In: Heer, Jeet and Worcester, Kent (eds. ), A Comics Studies Reader, 116–23. Jackson, MS: University of Mississippi Press, 2009. Molotiu, Andrei (ed.). Abstract Comics: The Anthology, 1967–2009. Seattle: Fantagraphics, 2009. Mondomix. ‘Areski: concert de dessins à Angoulême’. 2013. https://www.youtube.com/watch?v=U-4-HQDzkWs Accessed 22 June 2018. Murch, Walter. ‘Foreword’. In: Chion, Michel, Audio-Vision: Sound on Screen, ed. and trans. by Gorbman, Claudia, vii–xxiv, 1994. New York: Columbia University Press. Nelson, Robin. ‘Prospective Mapping’. In: Bay-Cheng, Sarah and others (eds. ), Mapping Intermediality in Performance, 13–23, 2010. Amsterdam: Amsterdam University Press. Peeters, Benoît. Case, planche, récit. Tournai: Casterman, 1991. Redner, Gregg. Deleuze and Film Music: Building a Methodological Bridge between Film Theory and Music. Bristol: Intellect, 2011. Ren, Marietta. Phallaina. Smallbang and France télévisions Nouvelles écritures, 2016. Renard, Romain. Melvile: l’histoire de Samuel Beauclair. Brussels: Le Lombard, 2013. Rogers, Holly. ‘Introduction’. In: Rogers, Holly and Barham, Jeremy (eds. ), The Music and Sound of Experimental Film, 1–22, 2017. Oxford: Oxford University Press. Rosa, Hartmut. Resonanz: Eine Soziologie der Weltbeziehung. Berlin: Shurkamp, 2016. Sanders, Julie. Adaptation and Appropriation. Oxon: Routledge, 2006. Schechner, Richard. Performance Studies: An Introduction. 2nd ed. New York and London: Routledge, 2006. Screech, Matthew. ‘The Myth of May 68 in bandes dessinées’. Belphégor, 15(2), 2017. https://journals.openedition.org/belphegor/1012 Accessed 26 June 2018. Shaw-Miller, Simon. Eye hEar[:] The Visual in Music. London: Routledge, 2013. Shaw-Miller, Simon. ‘Separation and Conjunction: Music and Art, circa 1800–2010’. In: Daniels, Dieter and Naumann, Sandra (eds. ), See this Sound: Audiovisuology, 462–85. Cologne: Walther König, 2015. Shephard, Tim and Leonard, Annie (eds.). The Routledge Companion to Music and Visual Culture. New York and London: Routledge, 2014. Siméone, Christine. ‘Phallaina, la BD poétique qui défile sous vos doigts’. France Inter, January 2016. https://www.franceinter.fr/culture/phallaina-la-bd-poetique-qui-defile-sous-vos-doigts Accessed 26 June 2018. Sluijs, Jasper and Smelik, Anneke. ‘Interactivity and Affect in Intermedial Art: Theorizing Introverted and Extraverted Intermediality’. Intermédialités, 13: 177–96, 2009. https://www.erudit.org/en/journals/im/2009-n13-im3872/044046ar/ Accessed 6 April 2018. Smith, Susan J. ‘Soundscape’. Area, 26(3): 232–40, 1994. Stilwell, Robynn J. ‘Audiovisual Space in an Era of Technological Convergence’. In: Richardson, John, Gorbman, Claudia and Vernallis, Carol (eds. ), The Oxford Handbook of New Audiovisual Aesthetics, 125–45, 2013 Oxford: Oxford University Press. Stilwell, Robynn J. ‘The Fantastical Gap between Diegetic and Nondiegetic’. In: Goldmark, Daniel, Kramer, Lawrence and Leppert, Richard (eds. ), Beyond the Soundtrack: Representing Music in Cinema, 184–202, 2007. Berkeley: University of California Press. Tabachnick, Stephen E. and Saltzman, Esther Bendit (eds.). Drawn from the Classics: Essays on Graphic Adaptations of Literary Works. Jefferson, McFarland: 2015. Thompson, Emily Ann. The Soundscape of Modernity: Architectural Acoustics and the Culture of Listening in America, 1900–1933. Cambridge, MA: MIT Press, 2004. Villani, Arnaud. ‘Gilles Deleuze ou la possibilité de vivre’. Revue internationale de philosophie, 241(3): 301–22, 2007. Wolf, Werner. ‘Musicalized Fiction and Intermediality: Theoretical Aspects of Word and Music Studies ’. In: Bernhart, Walter (ed. ), Selected Essays on Intermediality by Werner Wolf (1992–2014): Theory and Typology, Literature-Music Relations, Transmedial Narratology, Miscellaneous Transmedial Phenomena, 259–77, 2017. Boston: BRILL. Wolf, Werner. The Musicalization of Fiction: A Study in the Theory and History of Intermediality. Amsterdam: Rodopi, 2009. Yacavone, Daniel. Spaces, Gaps, and Levels: From the Diegetic to the Aesthetic in Film Theory Music. Sound, and the Moving Image, 6(1): 21–37, 2012.